This is the second disc by Sergey Schepkin that I have had to review recently and it reinforces the powerful impression made on the first encounter. The first disc included an uncompromisingly modernistic, one might say anti-romantic, performance of Mussorgsky’s Pictures at an Exhibition that proved to strikingly individual and compelling. Although clearly very different repertoire Schepkin carries a similar performing aesthetic into performance of Bach’s keyboard works. 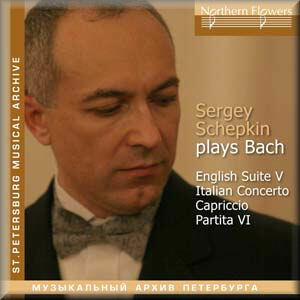 Although a native of St. Petersburg Schepkin is now a naturalised American citizen and clearly from the reviews quoted in the liner note his Bach performances in particular have caused a stir. What I like very much is the consistency and unfailing clarity of Schepkin’s vision. There is almost a ‘take or leave it’ approach that, as with the Mussorgsky, challenges the listener’s cosy and comfortable pre-conceptions about the music. Of course Bach, perhaps more than any other composer, is open to a myriad of vastly differing yet equally valid interpretational versions and we the listener can quite literally pay our money and make our choice. I find it unlikely that there will be much middle ground with listeners either finding the austere clarity of Schepkin’s playing either beautiful in its finely etched precision or simply chilly. As before, I must admit my first reaction was to find it too cool but then comparing it to other performances – for example, almost at random Maria Tipo’s version on EMI of the Italian Concerto – I found increasingly that it was these other more interventionist performances that ultimately sounded fussy and less convincing. Not that I find all of the movements here engage me as powerfully. In rather simplistic terms I enjoy Schepkin’s playing of the slower reflective movements more than the quicker ones. This is because the total control he has allied to an utter lack of mannerism allows the gentler movements to speak with the pure clarity that is the musical equivalent of a mountain stream. Try track 3 Adagiosissimo from the Capriccio BWV992 which he allows to emerge in one very long musical arc with the phrase endings very subtly pointed. Likewise the Sarabande from the Partita No.6 although played with some force has a simplicity of utterance that I enjoy very much as does the central Andante of the Italian Concerto [track 15] – probably my favourite playing on the disc. This general style though did lead me to question whether a Steinway concert grand is the right instrument for this approach. For sure as part of a mixed recital it makes perfect sense but on disc in an all-Bach recital it is hard not to wonder whether a harpsichord might not have been more in tune with the overall vision. The quicker movements reveal just what a prodigious technique Schepkin has. He plays all of these pieces with an extraordinary clarity and control and at usually very high speed. Comparing him with Tipo shows that his Italian Concerto comes in a good two and a half minutes quicker, which in a work of only fourteen minutes (in the Tipo performance) is a huge difference. While this makes for very exciting and exhilarating playing it is at the cost of some of the music’s humanity. Schepkin’s Bach rarely smiles. But for a revelation of the contrapuntal brilliance of the writing it is hard to surpass. You will have a sense by now of my ambivalence; admiration, awe and respect balanced by a certain emotional distancing from this style of performance; my head is blown away, my heart often unmoved. And so we return to my initial thought – you will either love or loathe this playing and I think I could agree with either camp. On balance though it is clear that Schepkin is such a talented and thoughtful musician – he contributes an interesting liner note – that to dismiss his approach too quickly smacks of ignorance and a lack of open-mindedness by the listener. A last couple of quick observations; the recording which is clear and clean, much like the playing, emphasises the treble a fraction which somehow amplifies the coolness of the approach. Lastly, of course quantity should not win out over quality, but a sub-fifty minute album is very poor value these days when offered in this disc’s price bracket. Perhaps another half hour’s worth of Schepkin’s riveting performing personality would have wholly won me over. I’m not sure how often I will return to this disc but return I will – a performance to challenge not soothe.